Navient aka Sallie Mae Just Paid Me! In this post I wrote about paying off the last of my student loans, and how completely excited I am to move on to a new chapter of my financial life. I also mentioned how I overpaid by a few cents, just to be sure I paid in full. I wondered if they would send me a refund check and said I would post if they did. Well, even better… For years I used a Upromise credit card. The benefits were linked to my student loan bill and paid cash automatically to my loan every month. 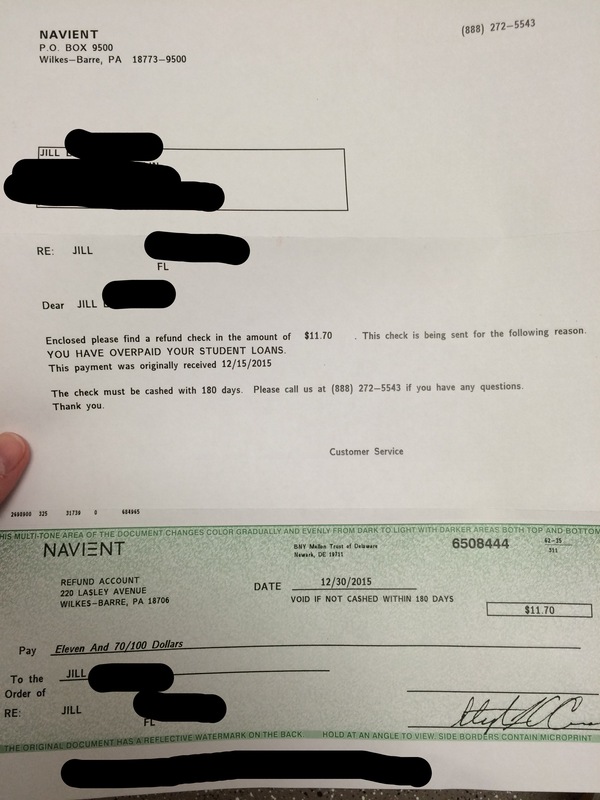 They made a payment I was unaware of, so I received $11.70! I was so excited when I saw I had mail from them. The feeling of them owing me money is pretty epic! I put it in my savings account. Obviously it’s a small amount, but every little bit matters. This is a HUGE accomplishment! Congratulations! Thank you 🙂 I still can’t believe it has actually happened! Wow! I can’t believe they repaid you so fast, that is epic in itself. You’re so responsible. I would have run to my nearest Mexican happy hour, ordered myself a margarita and had chips and salsa and yelled to anyone who would listen that this meal’s on the government… lol! Oh my gosh that is way better than my idea! Maybe I’ll still do that lol. My husband just got a check in the mail from Navient as well. We were skeptical about whether or not it’s legit. Any issues with this check? Was it actually valid? Well, did he pay off his loan? Mine was legit. They owed me a bit because I overpaid, not knowing how much interest they would add by the time they received my last payment.